It has never been easier to get to your next appointment. Flobot Field has all the information about your upcoming job. All you need to do is open it and click the car icon that will navigate you right there and tell you just how long it will take. 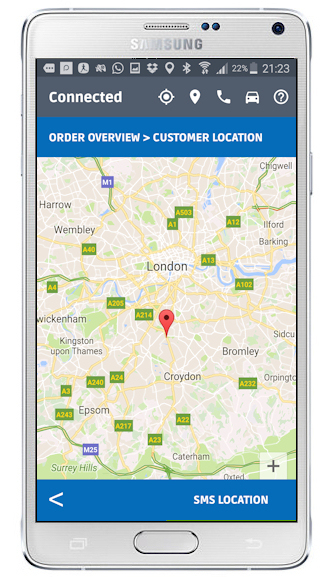 You can quickly see where your next customer is located by clicking the location symbol. You can also make a quick call to the customer by pressing the phone icon, send a text by pressing the message icon and send an 'I'm on route' SMS text by - well I think you get it by now. Flobot Field has been designed to have the features you need but just as importantly leave out the features you don't. It means that Flobot Field is intuitive and anyone can learn to use it in seconds. That means your field team members can get on with the jobs they are good at without spending time learning new technologies - or even worse - calling you about them. OK, the navigation won't work offline but the maps will!